Files – Go here to access your Thru file system. Emails – This is where you access any messages that you have sent with Thru. From here you can also immediately expire sent messages. 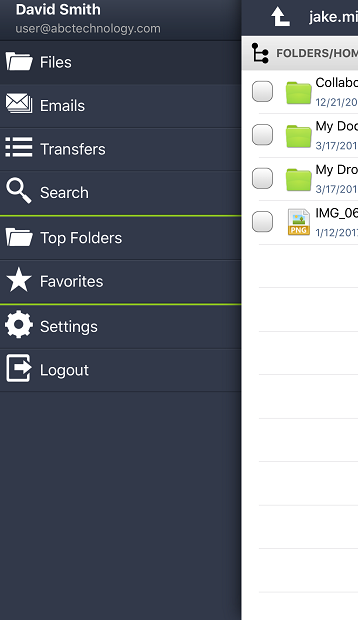 Transfers – Go here to view the progress of file uploads and downloads. Search – This selection allows you to search for file and folders that you have stored in Thru. You can search by name, description or by tag. Top Folders – This section displays the folders that you most often use. Favorites – This is where you access all files that you have “Added to Favorites”. Settings – From here you can access the Thru for iOS app settings such as reset your password, modify behaviors, clear cache, contact support, and more. Logout – Select this to log out of the Thru iOS application.